Nice jacket Michael Bauer. In case you couldn't tell, he is the man in the middle. Over in New York, the critics are not quite faceless, while Miss Irene down in LA only has a blurry photo to her credit. Here in the Bay, we kicked off the game of cat-and-mouse earlier in the month when we uncovered a suspicious yet inconclusive shot on SFGate that may or may not have been Mr. Michael Bauer, he of 20+ years of anonymity. 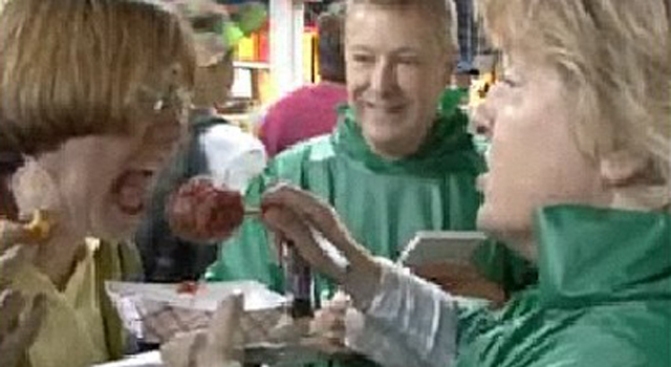 But today is a momentous day, and here we have some screengrabs from a video at the Minnesota State Fair (yes, really). Bauerlicious himself is interviewed sans face in the beginning, but fortunately, he appears in the background around the 1:20 mark.